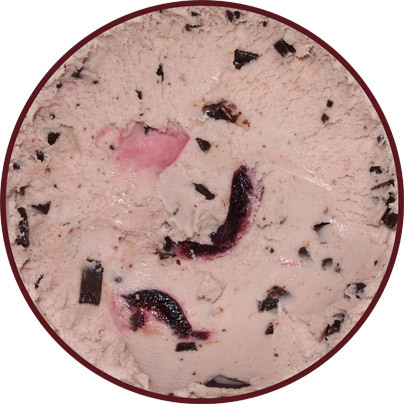 [New for 2012, 2nd St has closed up shop before the 2015 ice cream season] Now you may remember my first 2nd St Creamery review back in October. It was a mixed bag of results. It was an awesome looking ice cream, but we had technical difficulties that may or may not have been my fault. We kind of got a 50/50 in the comment section of people who loved this new lineup versus people who had the exact same problem I did. 50%, while not an overwhelming majority, is enough to convince me that these guys need another shot, especially when "these guys" means the fine folks over at Wells Enterprises (Blue Bunny)... oh, and it was on sale for half off, that helped too. 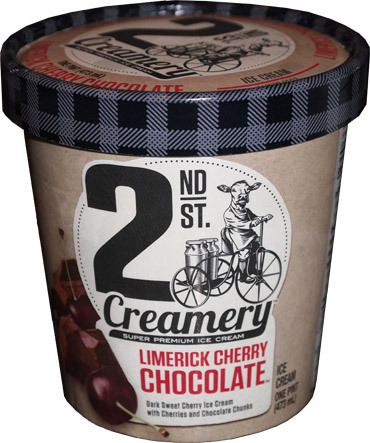 This is Limerick Cherry Chocolate Super Premium Ice Cream and while I don't know what limerick has to do with anything, I do know that the description of "dark sweet cherry ice cream with cherries and chocolate chunks" sure sounds a lot like my wife's beloved Cherry Garcia. Let's get this puppy opened up. Ok, so what are the three big things you notice that are different from Cherry Garcia? One, it's pink (I'm always thrown off when fruity flavors have no color, I'm immature like that). Two, it's got much smaller chips (though there are tons of them). Three, and this is subtle, but those are some strongly colored cherries. I don't know my cherries very well, but the color bleeding out like that seems kind of unnatural. I dive in and the first thing that hits you is how many chips there are. There is non-stop crunching action here, but they are thin, so it's a nice light crunch. However, so many chips doesn't mean an overload of chocolate flavor. It's actually kind of a dry chip, and they don't have a real potent flavor, so it's taking first place in the texture race, but second in the flavor race. I wasn't really sure how I felt about this one at first. The cherry flavoring is... well, flat. It's not a potent or biting flavor like I expected. So often a cherry flavor will almost give off that tingly Dr. Pepper vibe, but not here. It's cherry, but kind of a back seat flavor, almost a flat cherry soda kind of vibe actually. These terms may seem unflattering, but I'm trying to convey that this one is meant for those of us who don't dig a strong cherry flavor. It's trying to be pleasant, not potent. Thankfully the pint's texture isn't damaged like last time. Had it been off, then I would have been hesitant to try 2nd St a third time, but we've got a respectable ice cream going on here. I actually only took a small serving to start and it was good enough that I went back for a bit more. Unfortunately a pint doesn't last too long in my house, so we'll defer to my wife for the second scoop. On Second Scoop: My wife says it's good, but not Cherry Garcia good. It's not so much the base that's different for her so much as her love of the giant chocolate chips in the Ben & Jerry's version. So it may not sound like it directly, that's still a thumbs up from her. Guessing you haven't tried the Copper Kettle Caramel yet. Which means you really really need to get on that. unfortunately they didnt have any, I was bummed! You are brave to try this brand again. I'm an optimistic person but after my first pint, I will not be trying this again.. Free or not. As others say, you need to do Copper Kettle Caramel. It's the shining star of this line.